Xylo Plus Nasal Spray: Each bottle contains 120 metered doses of Xylometazoline Hydrochloride BP and Sodium Cromoglicate BP. Each actuation delivers Xylometazoline Hydrochloride BP 0.0325mg and Sodium Cromoglicate BP 2.6mg. Xylometazoline Hydrochloride is a sympathomimetic agent with alpha-adrenergic activity. It produces vasoconstriction thus reducing nasal congestion. This enables patients suffering from colds to breathe more easily through the nose. Sodium Cromoglicate usually acts through a local effect on the nasal mucosa. It prevents release of the mediators of type-l allergic reactions, including histamine and slow reacting substance of anaphylaxis (SRS-A) from sensitized mast cells after the antigen-antibody union has taken place. The drug does not inhibit the binding of IgE and the specific antigen; instead it suppresses the release of substances (e.g., histamine, SRS-A) in response to this reaction. The drug also inhibits Type-III (late allergic, Arthers) reactions to a lesser extent. 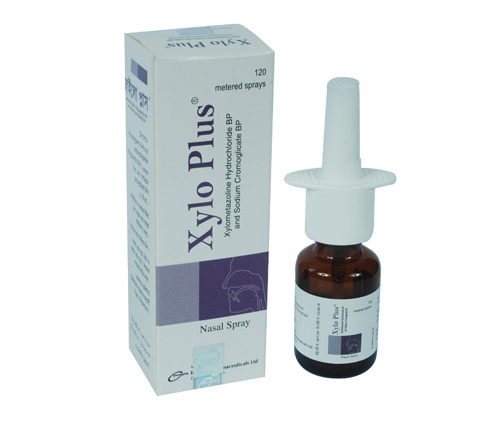 Xylo Plus Nasal Spray is indicated for the prophylaxis and treatment of allergic rhinitis (such as hay fever and perennial rhinitis) where this is accompanied by nasal congestion. Adults (including the elderly) and children: One spray each nostril four times daily. No serious side effects have been reported. Occasional irritation of the nasal mucosa may occur during the first day of use. In rare cases with Sodium Cromoglicate solutions alone wheezing and tightness of the chest has been reported. Because a lower dose of Xylometazoline is employed in this preparation it causes mild side effects such as nasal irritation, dryness of the nose, sneezing, headache, insomnia, drowsiness and palpitations. The prolonged use or abuse of decongestants in general may lead to rebound congestion or drug induced rhinitis. As with all medicines, caution should be exercised during pregnancy especially during the first trimester.